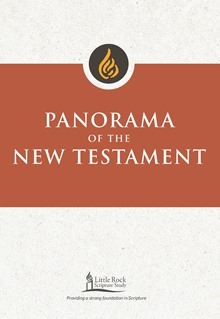 Beginning with the Gospels and Acts and continuing through the letters and final book of the Bible, Panorama of the New Testament invites us into familiar scenes but with a wide-angle lens to capture the big picture. For newcomers to Bible study, this is a wonderful place to begin to put the pieces together; for seasoned Bible students, this study identifies major themes that emerge throughout the New Testament books. Commentary, study and reflection questions, prayer and access to recorded lectures are included. 4 lessons.